View the available shows page to get an idea of what is available, then send e-mail to aaron AT damommio DOT com. The age range of the audience. Your contact information (e-mail and phone, including a day-of-the-show phone number for emergencies). 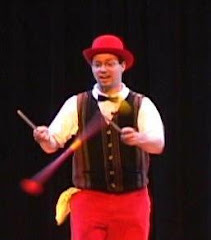 Performance space: Usually a 10' diameter semicircle, unless I'm doing a wandering juggler act. Light: Juggling takes light....lots more than a music act needs. Sound: I don't require sound amplification. But are there other activities going on that will drown out my mostly verbal act? I'll need to know about them; we should discuss the situation. Are there noisy machines? Air conditioners? Musical acts? Yes, I have a painful anecdote for each of these. :) Hey, I can do a silent act if I need to, but I'd like to know that before I get there. When I get your message, I'll get back to you to let you know whether I'm available, quote you a price, and talk about any remaining details.